The JKMRC is located at The University of Queensland Experimental Mine in the Brisbane suburb of Indooroopilly, seven kilometres from the main University campus at St Lucia. 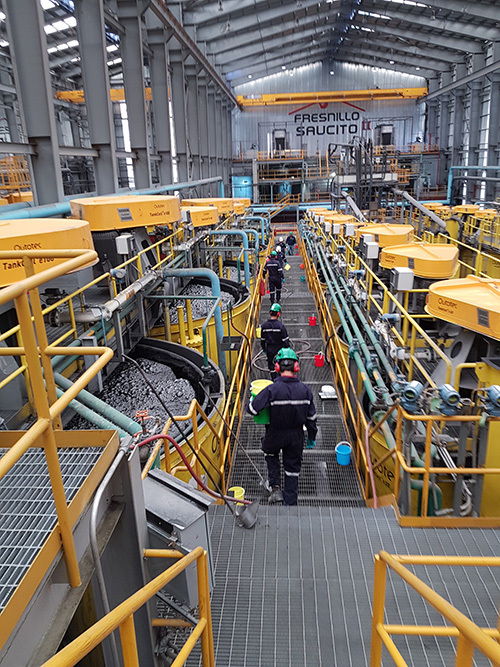 As well as undertaking research activities at the JKMRC, work is also carried out at mine sites, processing plants and research facilities throughout the world. The JKMRC pilot plant contains a suite of standard and custom-built mineral processing equipment, including JKMRC developed innovative ore characterisation equipment which are now utilised worldwide. A large range of testing capabilities to cover pre-concentration, comminution, separation and geometallurgy are available for our research programs. Our facilities are also conditioned to receive a large quantity of samples in which we have been able to store samples from different parts of the world that had played an important role in the past and present research programs at the centre. The MCRF also provides an extension of our testing capabilities in flotation, breakage characterisation and sizing analysis to support the undergoing work at the centre. Flotation characterisation involves batch or continuous flotation testing on flotation machines developed and built on our workshops. Flotation testing is performed at small and large scale. Our bottom driven machines are able to handle cells of up to 5 litres of capacity. Comminution Testing, involves testing the breakage characteristics of rocks in a wide range of size from 60mm down to below 1 under compression, impact, or abrasion, to determine the distribution of particles strength and size distribution of the progeny. Novel comminution can also be performed in JKMRC’s Selfrag High Voltage lab unit. Sizing analyses by producing size distribution of ore samples using different sizing techniques including dry and wet sieving, cyclosizing and laser-sizing. The equipment fabrication workshop is a critical adjunct to the Pilot Plant, particularly for fabricating research prototypes. Specialist measuring equipment can be built on site at the instrument laboratory. The JK Centre library is a small but specialised resource primarily for the use of Centre staff, students and alumni. The Librarian offers technical support to researchers and students centre wide through reference searching and liaison with other libraries. It is open from 9-12.30 Tuesdays and Thursdays and is designed to complement the collection held at the University of Queensland’s Engineering and Science Library. The JKMRC has a fully serviced lecture theatre with seating for 100 people, as well as a more informal classroom that can comfortably fit 20. Five meeting rooms are also available. These facilities are regularly used for seminars, special presentations, client meetings, training and user group meetings. The University Experimental Mine is unique to mining schools in Australia . In 1951, a former silver and lead mine situated at Finney's Hill in the Brisbane suburb of Indooroopilly was acquired by The University of Queensland's School of Mining Engineering. JKMRC has been active in applied mining industry research across Australia for over 50 years. Also, it has been at the forefront of research activities across Australia’s minerals sector throughout its history. The centre is the home of AMIRA P9, the world’s longest running minerals processing research project, which started in Australia at the JKMRC in the 1960’s and has become a highly collaborative international program. JKMRC leads Australian-focussed mining and minerals processing research projects in all states of the country, across the entire mine value chain, from blasting, to comminution, flotation and more. Project “Stress intensity in stirred milling”; a study of innovative stirrer design for stirred milling technology. Focus is on building a prototype to better understand and improve the grinding zone in stirred mills. Project being delivered includes experimentation on and investigation of stirrer design. Recent seed funding has been achieved with Weir in Australia to workshop and engage with the client to identify further research opportunities. JKMRC is working in partnership with an Australian copper operation to conduct surveys of their grinding and flotation circuits. The project is applying the centre’s extensive modelling capability to characterise the ore and assess strategies for circuit improvement. JKMRC is working in conjunction with a number of Australian mining operations to assess the potential of High Voltage Pulse Comminution (HVP) to improve energy efficiency in grinding and downstream separation efficiencies. HVP has the potential to enhance pre-concentration by size separation, pre-weaken an ore and enhance mineral liberation after grinding. JKMRC is working in partnership with the Huazhong University of Science and Technology, China, researching the potential for using High Voltage Pulse (HVP) technology for comminution. The aim is to transform HVP from a laboratory based process to something that can be used to process large tonnage rates economically. JKMRC works in South Africa on multiple projects. Examples include a study of the EDS Multi Shaft Mill, focussing on the validation of EDEM simulation results through the surveying of the mill on two different ore types. 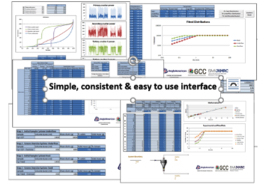 The main goals of this project are to perform comprehensive surveys of the mill under various conditions, replicate the test conditions through simulation, and compare simulation and survey results to enable more effective prediction and optimisation of mill performance. This project has lead to a publication in the prestigious Minerals Engineering journal as well as published online in the research spotlights of EDEM. Also in South Africa, the project “Anglo Process Improvement Tools” is being conducted. This is a fast tracked research initiative based on research outcomes from site work, and applies modelling tools along with detailed diagnostic theories to address operational issues. The main objective is to create a consistent and easy to use set of tools, accompanied by a detailed up-to-date diagnostic theory for use by site-based personnel. An online toolbox active on Anglo American’s Intranet and GCC website is being implemented as part of the project deliverables. JKMRC works throughout South America with active projects in Brazil and Mexico. In Brazil we are carrying out a project at Minas Gerais. The “Minas Rio site surveys” project is using a sampling and survey program to model the Minas Rio iron ore grinding circuit. The main goals are to provide a simulator of the Minas Rio grinding circuit using customised modelling tools to improve plant configuration and performance. Review and recommendations on sampling techniques and multiple surveys are part of the project outcomes. In Mexico, a project is being conducted at Minera Saucito, Fresnillo, Zacatecas. JKMRC researchers conducted comminution and flotation site work to compare the performance of hydrocyclones and multi-deck screens. This pioneering research project is showing interesting liberation and recovery behaviour patterns across different classification mechanisms. Two high profile papers have already been published on this work, one of which received the best presentation award at the 2017 MetPlant conference. 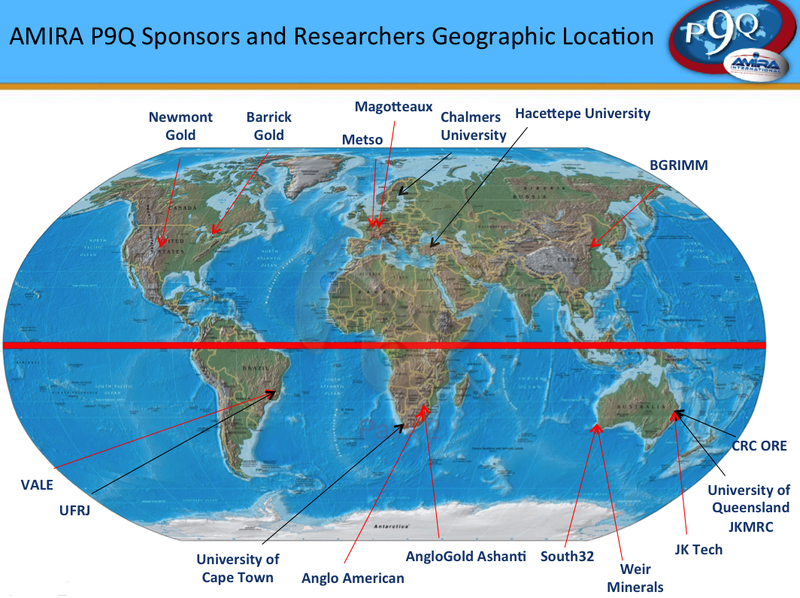 Through the AMIRA P9Q project, lead by Dr Mohsen Yahyaei, JKMRC works in this global collaborative research initiative that includes the University of Queensland, the University of Cape Town (South Africa), Chalmers University (Sweden), Hacettepe University (Turkey), Federal University of Rio de Janeiro (Brazil), CRC ORE and an international group of eleven mining company and supplier sponsors.